When we think of radicals and revolutionary figures of the sixties, names like Ché Guevara or Stokely Carmichael might come up, but probably the last person we would think of would be Fred McFeely Rogers, the soft-spoken writer, producer, and star of the long-running children’s television program “Mister Rogers’ Neighborhood” (1968-2001). Yet the theme song that opened each show, “Won’t You Be My Neighbor?” with its line, “I have always wanted to have a neighbor just like you,” was a pretty radical idea to those who did not relish having some folks being their neighbor. 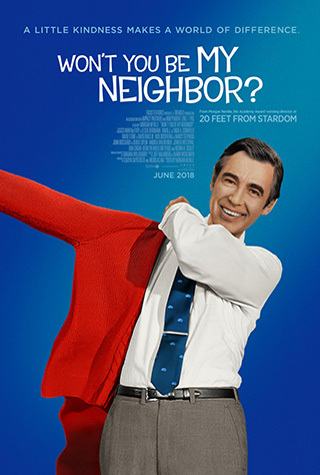 Rogers’ lifelong devotion to building an alternative community that could serve as a model of inclusion for children and adults to emulate is movingly documented by Oscar winning director Morgan Neville (“Best of Enemies”) in Won’t You Be My Neighbor? The film is an inspiring tribute to Rogers, a pacifist and former ordained Presbyterian minister who, over a period of more than thirty years on television, stood for the idea that there is a divine spark in all of us that needs to be nurtured. Looking at Rogers’ life and career through the eyes of those who knew him best, those interviewed include his wife Joanne, his two sons John and James who describe the challenge of having “the second Christ as a father,” cast members David Newell (Mr. McFeely), François Clemmons (Officer Clemmons), and Joe Negri (“Handyman”), and guests such as acclaimed cellist Yo-Yo Ma. Rogers was originally drawn to educational television as a result of his disdain for the demeaning and violent cartoons that marked children’s television programming at the time. While his show was usually lighthearted, he did not shun controversial topics such death, feeling blue, divorce, and assassination which he talked about with the children after Bobby Kennedy was killed. While the documentary does not go into any depth about Rogers’ personal or political life, it does single out his stand against the Vietnam War, his bringing an African-American teacher and a group of black students into his home and, after the assassination of Martin Luther King, his invitation to a black police officer (Clemmons) to be on his show during which they sat and talked together with their feet in a wading pool. Also documented is Rogers’ 1969 testimony before the United States Senate requesting a $20 million grant to continue funding PBS after their budget had been cut because of the Vietnam War. At the hearing, he won over the reluctant Rhode Island Senator John Pastore by reciting the lyrics to the song “What Do You Do with the Mad that You Feel?” After listening to the words, Pastore declared, “I think it’s wonderful. I think it’s wonderful. Looks like you just earned the $20 million.” Teased by classmates for being overweight as a boy (they called him “Fat Freddie”), Rogers never forgot the pain of being an outsider and had to deal with his own problems of self-esteem and depression. Rogers’ wife Joanne tells us that he used his puppets including Daniel Striped Tiger to express his most vulnerable feelings. One of the most moving sequences is his conversation with Jeff Erlanger, a severely disabled ten-year-old, in which they talked openly about disability and the sadness that often accompanies it. To make sure we knew that he was not a saint, Neville recounts how Rogers told Clemmons not to be seen frequenting a gay bar because the show would lose sponsors, but also makes clear that he eventually came around to fully accept him regardless of his sexual preferences. The centerpiece of Won’t You Be My Neighbor? is not politics, however, but Rogers’ ability to touch the lives of children and make them feel special, many of whom responded to him with lifelong affection. Accused by some of promoting a feeling of entitlement in each child, Rogers said, “Only people who take the time to see our work can begin to understand the depth of it.” Professor Michael Long, the author of the 2015 book “Peaceful Neighbor: Discovering the Countercultural Mister Rogers,” says that he spent his life assuring children that no matter what they look like, no matter who they were, no matter where they came from, deep within them was something that was lovable and capable of loving. Especially today when some children are being used as political pawns, it is inspiring to be reminded of what kindness and love is all about. IMDb Info: Won't You Be My Neighbor? Official Page: Won't You Be My Neighbor?